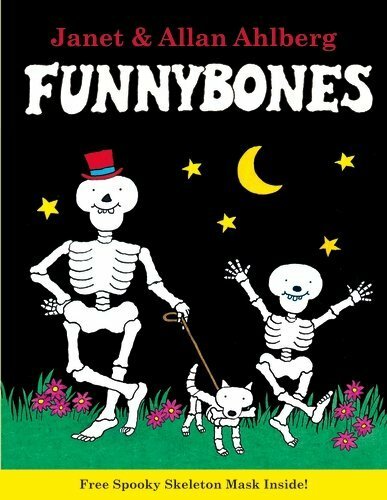 I was so excited to find a copy of Funnybones in a charity shop in the summer, it was one of the books that I had in the book corner of my first classroom and was very popular among the four and five year olds in my class. My daughter and I have read it several times since we bought it, it’s a great book for a beginner reader and a fun read for Halloween. The Story: Three skeletons, a big one, a little one and a dog, live in a dark cellar. One night they decide to take their dog for a walk and frighten somebody. As the dog is chasing a stick he bumps into a tree and falls apart so the big skeleton and the little skeleton put him back together before visiting their skeleton friends at the zoo. They still haven’t frightened anybody so the little skeleton suggests that they frighten each other. Funnybones begins in a dark cellar in a dark house where we are introduced to the three skeletons through a very atmospheric, repetitive text. The story describes their walk and takes them to the park and the zoo, both familiar situations for young children. The text is easy to read and the repetition is great for a beginner reader (the story goes full circle with the repetition on the final page of the story mirroring the first page). The illustrations are colourful on a dark background and have a comic style feel to them with speech bubbles to move the story along. Much of the humour comes from the illustrations. We love the illustrations where the skeletons are putting the dog back together, not only do they put him back incorrectly but when he says ‘Woof’ it comes out all muddled too! Funnybones is a fun book to introduce children to the concept of having a skeleton and could be used in a My Body classroom topic. Some bone names are introduced in the story when the skeletons sing some of the lyrics of The Skeleton Dance as they put the dog back together. We put our own moveable skeleton puppet together using this Preschool Activities template, we’re still looking for a glow in the dark pen to colour it with so we can hang it in our window for Halloween. There are several more Funnybones stories that we haven’t read. Have you read any of the other Funnybones stories? Which would you recommend? If you’re planning a Funnybones party for Halloween Puffin Books have a great idea for a Funnybones costume, a recipe for Funnybones biscuits and Funnybones bunting and party decorations. They have some of the Funny Bones books at my local library and I like to sit down and read them with my son. Some books are just timeless! I loved having a collection of Halloween books handy as a kid. This is a new one for me. Thanks for sharing! Hopping over from the Kid Lit Blog Hop. Thank you for bringing it to my attention, I’m going to go on the hunt for a second hand one – they’ll love it! Hey! Here from KidLit Blog Hop! Looks like a great book pick especially for Halloween I love that you included an activity you and your daughter did. It looks like so much fun! How adorable! I’m loving that skeleton – a glow in the dark pen will be the perfect addition!! I thought exactly the same when I saw it in the charity shop – a real blast from the past! This is one of my all time favorite books! I found it on the book shelf the other day and realised I had not read it to the children for far too long! It’s been added to next weeks story basket!! I loved these books when I was a child! They have some at my local library and I keep meaning to get them out for Lily, I hope my kids love them too. They’re such simple stories, I’m glad my daughter enjoyed this one as much as me. The repetition and the inclusion of the song lyrics makes it a great book for her to read independently. I loved FunnyBones when I was little, too! Sadly, my daughter wasn’t as excited by them as I was when we got a copy from the library – I’m hoping my son will be! It really is a proper classic! Love Janet and Allan Ahlberg! Thanks for sharing in the Kid Lit Blog Hop! I love your extension ideas! So perfect for Halloween! Thanks for sharing at the Kid Lit Blog Hop Catherine! 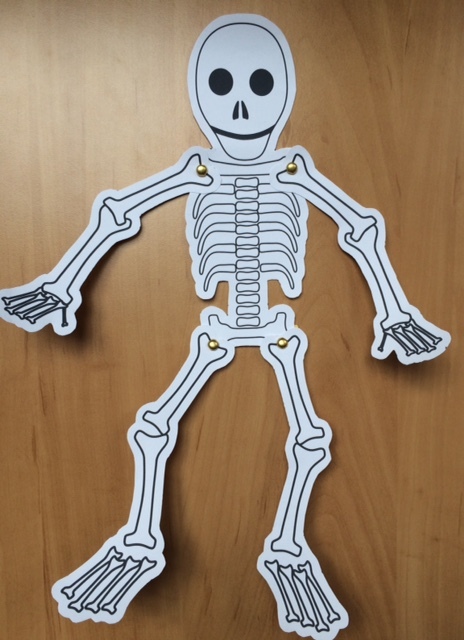 We couldn’t review a book about skeletons without making one of our own – we’re still looking for a glow in the dark pen to colour him in though!